The individual income tax is one of the most significant sources of revenue for state and local governments, accounting for 23.5 percent of state and local tax collections in fiscal year (FY) 2015 (the most recent data available). Other significant sources of state and local revenue include property taxes, which accounted for 31.1 percent of state and local tax collections, as well as general sales taxes, which matched the individual income tax at 23.5 percent of state and local tax collections. 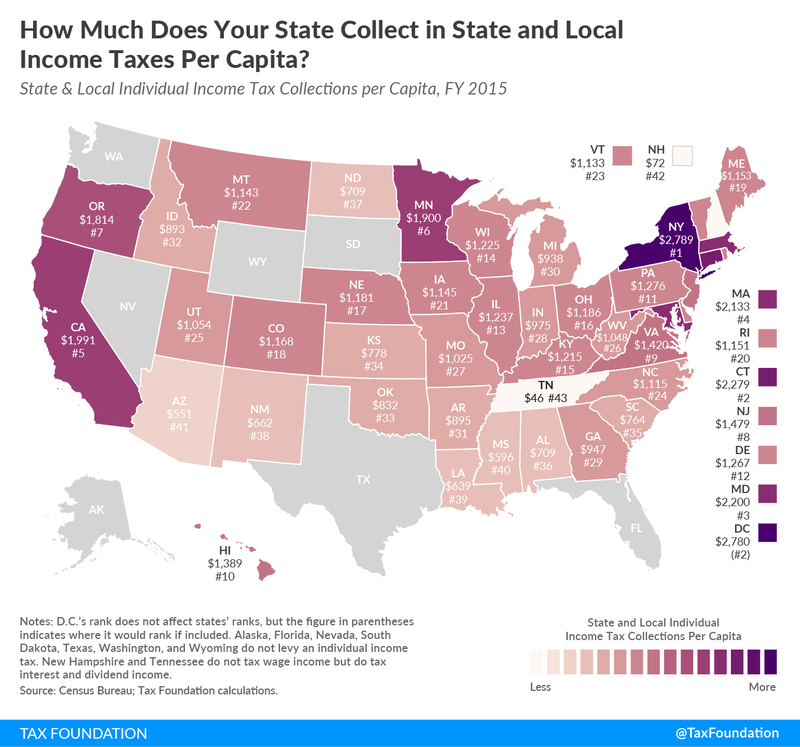 The below map shows combined state and local individual income tax collections per capita for each state in FY 2015. Forty-one states and the District of Columbia levy broad-based taxes on wage income and investment income, while two states – New Hampshire and Tennessee – tax investment income but not wage income. Tennessee’s tax on investment income – known as the “Hall tax” – is in the process of being phased out and will be fully repealed by 2021. Seven states do not levy an individual income tax: Alaska, Florida, Nevada, South Dakota, Texas, Washington, and Wyoming. On average, state and local governments collected $1,144 per person from individual income taxes, but collections varied widely from state to state. States collecting the most in per capita state and local individual income taxes were New York ($2,789), Connecticut ($2,279), and Maryland ($2,200). The lowest per capita individual income tax collections occurred in the states that tax dividend and interest income but not wage income: Tennessee ($46) and New Hampshire ($72). Of the states that tax wage income, lowest per capita collections occurred in Louisiana ($639), Mississippi ($596), and Arizona ($551). The Tax Cuts and Jobs Act (TCJA) removed investment barriers by allowing businesses to immediately deduct the cost of certain investments under a provision called 100 percent bonus depreciation. However, seemingly due to legislative oversight, the law accidentally excluded the category of improvement property investment from 100 percent bonus depreciation. As a result, investments of this type face a higher tax burden than under prior law. More restrictive cost recovery treatment for interior improvements to buildings will increase costs and discourage companies from making these types of investments. All business expenses should be immediately deductible, including the amount that businesses spend on investment. Policymakers should work to ensure that cost recovery for qualified improvement property (QIP) does not remain worse off due to technical drafting errors, and that it is eligible for 100 percent bonus depreciation. Removing barriers to business investment in the United States was one of the central goals of the Tax Cuts and Jobs Act (TCJA), enacted last December. One of the key provisions in the bill, known as “100 percent bonus depreciation,” allows businesses to immediately deduct the cost of short-lived investments—limiting the penalty that the federal tax code placed on businesses that make capital investments in the United States. However, the law excludes some categories of business investment from 100 percent bonus depreciation. For instance, many interior improvements to buildings are not eligible for the provision, and will be required to be written off over time periods as long as 39 years. This exclusion is widely believed to have been due to a legislative oversight: Congress seems to have intended building improvements to be eligible for 100 percent bonus depreciation, but left them out due to a last-minute drafting error. As a result, the new tax law actually worsens the tax treatment of this type of investment, which previously qualified for bonus depreciation, by reducing the ability of businesses to deduct their full building improvement costs. Ideally, all business expenses should be immediately deductible, including the amount that businesses spend on capital investment. As such, the exclusion of building improvements from the benefit of 100 percent bonus depreciation—whether accidental or not—is unjustified. Policymakers should act to ensure that qualified improvement property is eligible for 100 percent bonus depreciation; at a minimum, they should make sure that the rules for deducting the cost of building improvements do not become more restrictive than they previously were. Under the U.S. tax code, businesses can generally deduct their ordinary business costs when figuring their income for income tax purposes. However, this is not always the case for the costs of capital investments, such as equipment, machinery, and buildings. Typically, when businesses incur these sorts of costs, they must deduct them over several years according to depreciation schedules instead of immediately in the year the investment occurs. This system that requires businesses to deduct their capital expenditures over time rather than immediately is quite complicated and means businesses cannot fully recover the cost of those investments. The disallowed portion of cost recovery understates costs and overstates profits, which leads to greater tax burdens. The tax code increases the cost of capital, which leads to less capital investment and lower employment, output, and wages. Full expensing, however, allows businesses to immediately deduct 100 percent of the cost of their capital expenses. Thus, it removes a bias against investment in the tax code and lowers the cost of capital, encouraging business investment. Prior to the Tax Cuts and Jobs Act, the tax code categorized certain interior building improvements into different classes: qualified leasehold improvement property, qualified restaurant property, and qualified retail improvement property. Under prior law, assets with lives of 20 years or less were eligible for 50 percent bonus depreciation. While most building improvements are generally depreciable over 39 years, improvements meeting these category definitions were eligible for a 15-year cost recovery period and thus eligible for 50 percent bonus depreciation under old law. Improvement property generally includes interior improvements made in buildings that are nonresidential real property. If a business invested in new lighting, exit signs, or woodwork, these investments would generally be categorized as improvement property. Or consider a restaurant or retail store, perhaps with lots of foot traffic, and as a result it needs new permanent floor coverings; such an investment would also generally be qualified improvement property. The definition excludes improvements made to enlarge a building, for an elevator or escalator, or to the internal structural framework of a building. The PATH Act of 2015 created a fourth category, qualified improvement property (QIP), to extend bonus depreciation to additional improvements to building interiors. Under this new definition, unlike the other three types of improvement property, eligibility did not require that QIP investments be made under a lease. It also did not require a three-year lag between when the building was first placed in service and when the improvement property was placed in service. A notable feature of QIP, however, was that it did not have a cost recovery period of 15 years; for QIP to be recovered over a 15-year period, it had to also meet the definition of one of the other three types of improvement property. This means that in some instances, QIP may have qualified for bonus depreciation, but the remaining basis would have been depreciated over a 39-year period. This created complexity across different categories and definitions of improvement property. The TCJA, in addition to enacting 100 percent bonus depreciation for certain assets with a 20-year recovery period or shorter, made changes intended to simplify the tax code. Among these changes was the consolidation of the different types of improvement property under the single definition of Qualified Improvement Property, with intent to assign this new category a 15-year recovery period, eligible for 100 percent bonus depreciation. The wording of the final bill, however, fails to provide a recovery period, and as a result unintentionally makes QIP ineligible for 100 percent bonus depreciation. As a conforming amendment, the provision replaces the references in section 179(f) to qualified leasehold improvement property, qualified restaurant property, and qualified retail improvement property with a reference to qualified improvement property. Thus, for example, the provision allows section 179 expensing for improvement property without regard to whether the improvements are property subject to a lease, placed in service more than three years after the date the building was first placed in service, or made to a restaurant building. Senate Amendment: The provision eliminates the separate definitions of qualified leasehold improvement, qualified restaurant, and qualified retail improvement property, and provides a general 10-year recovery period for qualified improvement property, and a 20-year ADS recovery period for such property. Conference Agreement: The conference agreement follows the Senate amendment….In addition, the conference agreement provides a general 15-year MACRS recovery period for qualified improvement property. 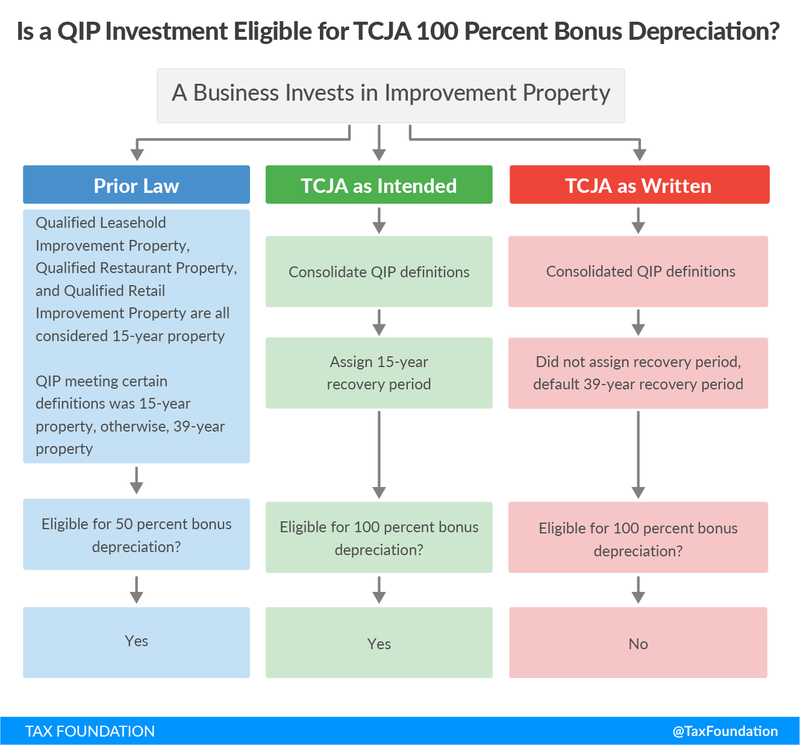 Recall that for property to qualify for the TCJA’s 100 percent bonus depreciation provision, it must be property “with an applicable recovery period of 20 years or less.” The conference agreement clearly intended to simplify the classifications of improvement property under the single heading of Qualified Improvement Property and assign a recovery period of 15 years to make QIP eligible for the new 100 percent bonus depreciation provision. The final changes made to legislative text did succeed in this first effort: it removed the separate categories of improvement property and added the new QIP definition. However, the changes to make QIP eligible for 100 percent bonus depreciation did not occur. The conference agreement removed the 10-year language from the Senate amendment but then failed to add the 15-year language decided during the Conference Committee. Also, it did not adequately update the 20-year language for the alternative recovery period. The result leaves the newly defined QIP category without an assigned recovery period, while the alternative recovery period definition references a 10-year period provision that does not exist in the final law. Source: Author’s calculations. Assumes half-year convention and 3.5 percent real discount rate plus inflation. Had the definitions of improvement property not been consolidated, investments in qualified improvement property would have been eligible for 100 percent bonus depreciation as they were for bonus depreciation under prior law. Instead, in what is seemingly a drafting error, businesses that invest in improvement property will face a higher tax burden under the new law despite the indicated legislative intent to improve the cost recovery treatment of improvement property (see Table 2). One of the most significant changes of the Tax Cuts and Jobs Act was to allow 100 percent bonus depreciation for assets with lives of 20 years or less. As enacted by the TCJA, 100 percent bonus depreciation allows businesses to immediately deduct the full cost of most short-life business investments (such as machinery and equipment), although not long-life assets like structures, which would be deductible under full expensing. When companies are instead required to deduct the cost of their investments over a number of years, the value of the depreciation deduction declines over time, making businesses unable to fully recover the cost of the initial investment. Source: Author’s calculations. Assumes half-year convention, 3.5 percent real discount rate, plus inflation. For example, under the TCJA 100 percent bonus depreciation provision, if a company makes a qualifying $100 capital investment it would immediately deduct the full cost of that investment. However, if the investment is not eligible for 100 percent bonus depreciation, the company must take depreciation allowances, preventing full recovery of the cost of the investment. Consider that capital investments in structures—one type of investment that does not qualify for 100 percent bonus depreciation under the TCJA—must be depreciated over a 39-year period. As noted in Table 3, the present value of this type of investment falls from $100 under 100 percent bonus depreciation to as low as $37.24—meaning in some instances businesses are unable to recover even half of their initial investment costs. This treatment understates costs and overstates profits, which in turn leads to a greater tax burden that increases the cost of making those types of investments. This treatment discourages businesses from making capital investments because they are unable to fully recover their costs. Businesses in this situation, with the inability to fully deduct the cost of their investments, face higher tax burdens because their profits are overstated. Figure 2 illustrates this for a $100 investment in a property that is not eligible for 100 percent bonus depreciation. 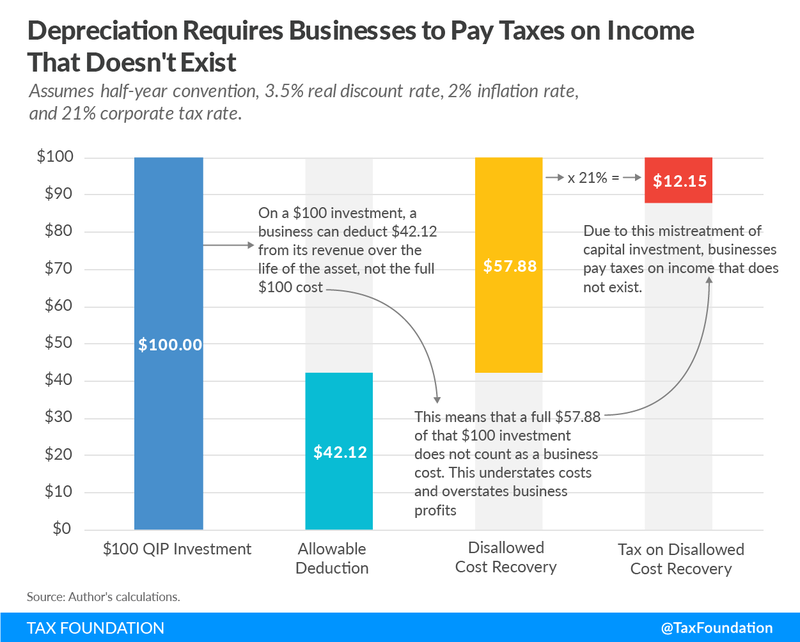 Under current law, businesses would only be able to deduct $42.12 of their initial $100 investment over the 39-year recovery period, while the remaining $57.88 of costs would never be subtracted from revenue. The business would owe income tax on the overstated profit, resulting in a present value tax burden of $12.15, on income that doesn’t exist, which reduces the rate of return on the $100 investment. One hundred percent bonus depreciation removes this bias against investment. The Tax Cuts and Jobs Act, while effectively removing tax barriers to many categories of business investment, created new barriers for investing in qualified improvement property, seemingly by mistake. Businesses making investments to improve their property now face a more restrictive cost recovery period—more than twice than under prior law—and are excluded from 100 percent bonus depreciation. These businesses will face a higher tax burden on QIP investments than under previous law, an outcome that could have significant consequences, potentially slowing investment, employment, and output for those affected. The tax burden on building improvements should not have worsened due to tax reform. Policymakers should work to extend 100 percent bonus depreciation to qualified improvement property; at a minimum, they should make sure that the rules for deducting the cost of building improvements do not remain more restrictive than under previous law. Scott Greenberg, “What is Depreciation, and Why Was it Mentioned in Sunday Night’s Debate?” Tax Foundation, October 10, 2016, https://taxfoundation.org/what-depreciation-and-why-was-it-mentioned-sunday-night-s-debate/. KBKG, “Qualified Improvements – Depreciation Quick Reference (updated 3/2/2018),” https://www.kbkg.com/handouts/KBKG-Qualified-Improvement.pdf. Tony Nitti, “Tax Geek Tuesday: Changes To Depreciation In The New Tax Law,” Forbes, January 2, 2018, https://www.forbes.com/sites/anthonynitti/2018/01/02/tax-geek-tuesday-changes-to-depreciation-in-the-new-tax-law/#914a8f42c4bc. Eddie Price, “New Qualified Improvement Property Category in 2016,” National Society of Accountants, June 29, 2016, http://www.nsacct.org/blogs/eddie-price/2016/06/29/new-qualified-improvement-property-category-in-2016. Heather Alley, “PATH Act and Expanded Benefits for Real Property – A Case of True Déjà Vu?” Dixon Hughes Goodman LLP, February 8, 2016, https://www.dhgllp.com/resources/alerts/article/1532/path-act-and-expanded-benefits-for-real-property-a-case-of-true-deja-vu. “Joint Explanatory Statement of the Committee of Conference,” December 18, 2017, http://docs.house.gov/billsthisweek/20171218/Joint%20Explanatory%20Statement.pdf. Ibid, 204-205. The 10-year period was increased to a 15-year period in the conference agreement. Tax Foundation, “Preliminary Details and Analysis of the Tax Cuts and Jobs Act,” December 18, 2017, https://taxfoundation.org/final-tax-cuts-and-jobs-act-details-analysis/. Stephen J. Entin, “Tax Treatment of Structures Under Expensing,” Tax Foundation, May 24, 2017, https://taxfoundation.org/tax-treatment-structures-expensing/. Amir El-Sibaie, “Latvia Joins the Cash-Flow Tax Club,” Tax Foundation, April 16, 2018, https://taxfoundation.org/latvia-cash-flow-tax/. Scott Greenberg, “Cost Recovery for New Corporate Investments in 2012,” Tax Foundation, January 2016, 2, https://files.taxfoundation.org/20170517152414/TaxFoundation-FF495.pdf. Stephen J. Entin, “The Tax Treatment of Capital Assets and Its Effect on Growth: Expensing, Depreciation, and the Concept of Cost Recovery in the Tax System,” Tax Foundation, April 2013, https://files.taxfoundation.org/legacy/docs/bp67.pdf. For some background: a “tax expenditure” refers to any provision in the tax code that provides a special deduction, credit, exclusion, or other tax preference that wouldn’t be included in a “normal” tax code. The question of which specific tax provisions should count as tax expenditures is often up for debate; however, under any definition, it is clear that the federal government forgoes hundreds of billions of dollars in revenue each year due to tax expenditures. To show how the size of federal tax expenditures has changed as a result of the Tax Cuts and Jobs Act, the tables below compare JCT’s tax expenditure estimates from January 2017 (before passage of the law) to the estimates released last week. Specifically, the tables tabulate how several major tax expenditures were previously and are currently expected to affect federal revenue in fiscal year 2020. Three of the largest tax expenditures in the federal income tax code are itemized deductions: the mortgage interest deduction, the state and local tax deduction, and the charitable deduction. The amount of revenue that the federal government forgoes due to these three deductions is expected to decline sharply as a result of the 2017 tax law. For instance, the amount of revenue loss from the mortgage interest deduction, a provision which benefits homeowners, is expected to decline by over half. Last year, JCT estimated that the federal government would forgo $83.4 billion in revenue in 2020 due to the mortgage interest deduction; now, it estimates that the deduction will reduce revenue by only $36.9 billion. Even more dramatic are the effects of the 2017 tax law on the size of the deduction for state and local taxes paid. Previously, JCT estimated that this deduction would reduce federal revenue by $122.5 billion in 2020. Now, it estimates that the revenue loss due to the state and local tax deduction in 2020 will only be $24.4 billion. The charitable deduction, as well, is expected to cost the federal government less due to the 2017 tax law—though the difference is smaller than it is for the other two deductions. Last year, JCT estimated that the charitable deduction would lower federal revenue by $66.3 billion in 2020; now, that figure has dropped to $47.0 billion. There are three reasons why these deductions are expected to reduce federal revenue by less than what they once did. First, the 2017 tax law substantially increased the standard deduction, which is expected to lead fewer taxpayers to itemize, causing fewer households to make use of these provisions. Second, the law lowered marginal tax rates across the board for households, making each dollar of deductions less costly for the federal government. Finally, the 2017 tax law included explicit limits on two of these deductions: it capped the state and local tax deduction at $10,000 per household and the mortgage interest deduction at $750,000 of home acquisition debt. It is worth noting that all three of these changes are set to expire after 2025. In eight years, the caps on the mortgage interest and SALT deductions will expire, the increase in the standard deduction will be reversed, and marginal tax rates will rise across the board—all of which will increase the revenue loss from itemized deductions. An interesting feature of the 2017 tax law is that it indirectly reduced the size of several major tax expenditures, without making any direct changes to the provisions in question. This is because, for many of the provisions in question, the size of the tax expenditures varies with marginal tax rates. As a result, when the 2017 law lowered marginal tax rates across the board, it implicitly made many individual income tax expenditures smaller. To illustrate this phenomenon, consider the exclusion of employer-sponsored health insurance—which remains the largest tax expenditure in the federal tax code. Under this provision, the amount that employees receive in health insurance benefits is not counted as income that they are taxed on (even though it is surely a form of compensation like any other). Importantly, the amount of revenue that the government loses due to this provision depends on what tax rates would have applied to health insurance benefits if they were subject to tax. For a household in the old 25 percent bracket, receiving $1,000 of tax-exempt health benefits instead of $1,000 in wages leads to $250 of tax savings, and a $250 revenue loss for the federal government. If the household is in the new 24 percent bracket, the same situation would result in $240 of tax savings and $240 in revenue loss for the government. As a result, when the 2017 tax law lowered marginal rates across the board, it implicitly reduced the size of the exclusion of employer-provided health insurance. Last year, JCT estimated that this provision would reduce federal revenue by $189.5 billion in 2020. Now, it estimates a revenue loss of $182.5 billion in the same year. The same phenomenon applies to a number of other major federal tax expenditures. After passage of the 2017 tax law, JCT’s estimate of the revenue loss from the exclusion of Social Security benefits fell from $47.8 billion to $39.3 billion. Similarly, its estimate of the revenue forgone due to the exclusion of municipal bond interest fell from $42.5 billion to $31.7 billion. Importantly, all the individual income tax rate cuts in the Tax Cuts and Jobs Act are set to expire in 2025. This means that, absent congressional action, each of the tax expenditures described above would likely expand in size in 2026. Looking through the JCT tax expenditure report, the effect of the 2017 tax law is particularly clear when considering old tax expenditures that were eliminated and new tax expenditures that were created by the legislation. The domestic production activities deduction (section 199) was one of the few tax expenditures that was eliminated outright in the 2017 tax law. Previously, the provision offered the equivalent of a tax rate reduction to businesses that earned income from production in the United States. However, the provision was often criticized for favoring certain parts of the economy over others, as well as for being subject to abuse and gaming. The elimination of this provision is reflected in the JCT’s tax expenditure report: previously, it was estimated to cost the federal government $21.1 billion in 2020, a figure that has now fallen to $0. On the other hand, the 2017 tax law also created a new tax expenditure: a deduction (section 199A) for households that earn income from pass-through businesses—companies that are not subject to the corporate income tax, such as partnerships and S corporations. The new deduction allows households to exclude up to 20 percent of their pass-through business income from federal tax, subject to several restrictions. Because the provision lowers the tax rate on pass-through business income below the tax rate on wages and salaries, it was an easy call for the Joint Committee on Taxation to categorize it as a tax expenditure. The new pass-through deduction and the old domestic production deduction share a number of similar features. Both provisions include limitations based on the amount of wages that companies pay, as well as rules meant to exclude the services sector from seeing a tax benefit. Nevertheless, the new pass-through deduction is substantially larger than the old domestic production deduction: it is expected to reduce federal revenue by $57.6 billion in 2020. There are many other interesting stories that can be told by comparing JCT’s tax expenditure reports from 2017 and 2018. The examples above show some of the far-reaching effects of the Tax Cuts and Jobs Act on every part of the federal tax code. Of particular note is the fact that many of the changes to federal tax expenditures highlighted above are set to be reversed over the next ten years—due to the expiration of several individual income tax changes, including the higher standard deduction and lower marginal tax rates. Going forward, lawmakers should consider the potential side effects these scheduled changes would have on the size of federal tax expenditures. The year 2020 was chosen to avoid capturing any transitional revenue effects of changes to the federal tax code. Some of the revenue changes between JCT’s 2017 and 2018 estimates may be related to changing economic conditions or other factors, but it seems likely that the bulk of the differences are attributable to the 2017 tax law. The IRS issued guidance on the standard mileage rates and depreciation limits that were changed by the Tax Cuts and Jobs Act.